Instagram Message: Say Cheese! Cheese Lover's Day is Jan 20th - get inspired @thoughtfulpinch.com. I love cheese. I love cheese. I love cheese. I love cheese. I love cheese. I love cheese. I love cheese. Cheese Lover's Day is on January 20th. Do you know someone just like me? Get your thoughtful pinch ideas right here, right now. Cheese Straws from my cousin Jay-Jay. I have received bags of these straws for my birthday and Christmas for over 3 years but this is the largest bag I have ever received! This bag is too big to hide. I keep it in the freezer so whenever I need a little cheesy snack, I pull a handful out and they defrost in minutes. I'm pretty #blessed to receive bags of cheese straws for my birthday and for Christmas. I admit that I am so selfish with these things that I will hide the bags so that I can enjoy them all by myself. It's rare for me to share them. They are so good that if I open a bag of them, I usually eat all the straws in one sitting. Some of my very favorites cheeses are: Blue, Harvarti, Muenster, Baby Swiss, Brie, Jack, Extra Sharp Cheddar and this Montamore. Since I don't eat cheese every day (I try to avoid dairy), I find myself being snobby with my choices. I like organic (of course) and I like good quality cheeses. I'd rather skip cheese if it's not the best quality. Although on Thanksgiving, I did enjoy a lot of Velveeta nachos. So there's that. Anytime I want to stay on track but still get my cheese fix, I rely on goat cheese. 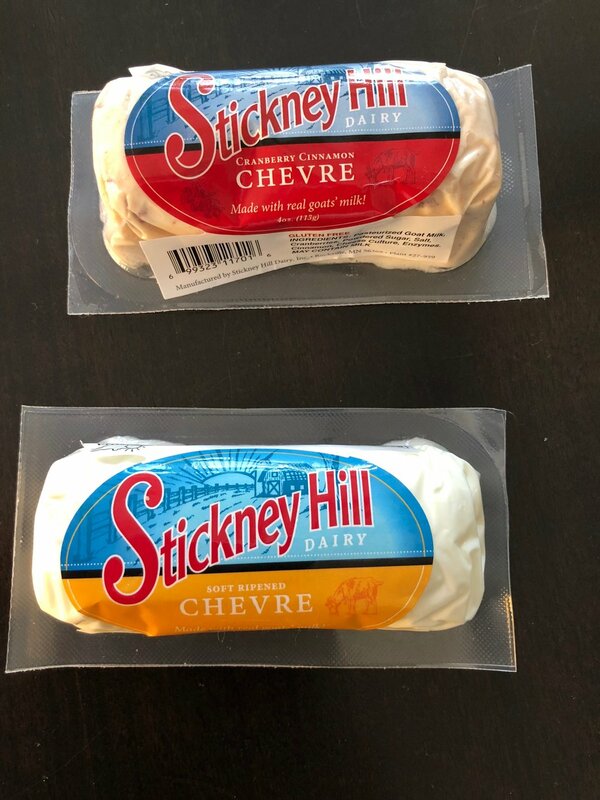 Especially Stickney Hills - their flavors are so great! Goat cheese gets me thru some times when cheese is all I want and need. As of now, Stickney Hill is not available nation-wide but I have a little inside connection so I know it may be called something else in other states and will be available everywhere - hopefully soon. I will let you know as soon as I know. My daughter can eat one of these tubes in one sitting. Served this bad boy with some Mary's Gone Crackers original flavor for my visiting brother-in-law and it was like a mini meal. 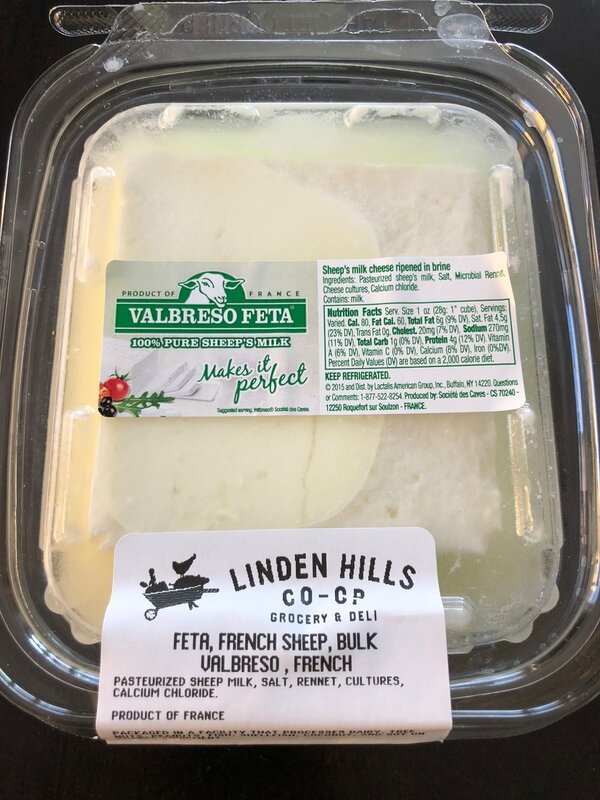 This sheep's milk feta tops my burgers, makes salads tasty and adds a lot of flavor to ANYTHING boring. I'm pulling out this recipe for Cheese Lover's Day. My friend's mother hand wrote the recipe over 20+ years ago and I'm grateful she shared it with me. I fondly remember making this cheeseball recipe and would give them out as Christmas gifts for years. I'm so glad there is a national holiday that honors the cheese lovers out there. Making and giving this cheeseball to someone is a perfect thoughtful pinch. In case cooking is not your thing or time doesn't permit, consider finding a cheese board in the shape of the home state. This cheeseboard was a previously featured thoughtful pinch when my mother moved from CA to MN from my friend Allison. Cheese cutters and spreaders also make fun thoughtful pinches for cheese lovers. 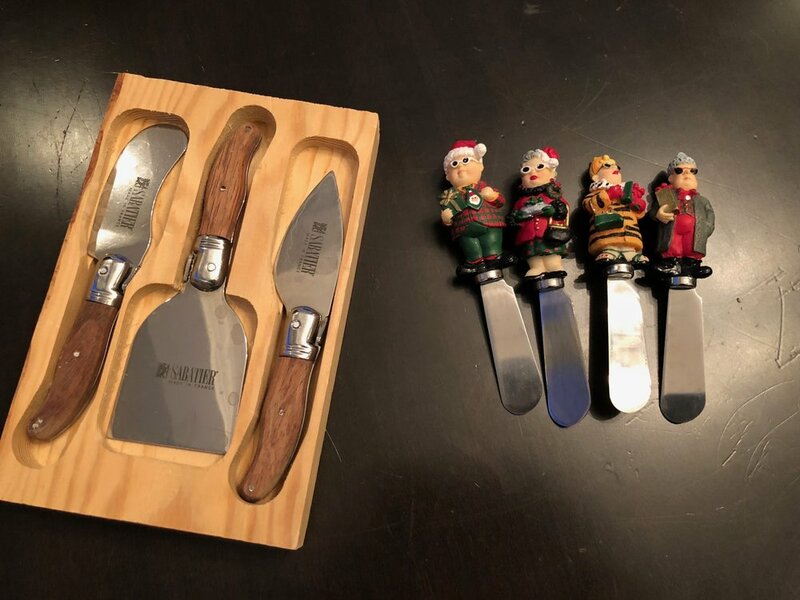 Choose some serious cheese cutters or crazy, fun spreaders. Knowledge is power. If you want to pinch a serious cheese lover and would rather give them something other than cheese or accessories, you can enlighten them with these tips. This info is from my Harmony Valley CSA. I have kept this newsletter for years because I fantasize that one day I will put together a wonderful charcuterie board. One day. Be creative with your gifts to a cheese lover. If you live anywhere in the mid-west, especially Wisconsin, buying your cheese lover a bucket of fried cheese curds is such an act of thoughtfulness. The right amount of saltiness and cheesiness is such a taste bud's fantasy. They should be warm and they have to be fresh otherwise, the taste is just not the same. I'm pretty sure fried cheese curd recipes can be Googled or Pinterested if you're not in my neck of the woods. You can always make some. The Minnesota State Fair and/or US Bank Stadium (home of the Vikings) has the best fried cheese curds I've tried. Although anyone from WI would probably disagree with me. This picture was taken before my cousins Jay-Jay and Pauline ever tasted a fried cheese curd. Y'all don't have these curds in the south. I'm a big cheese lover. I love cheese. But please do not confuse me with a cheese head. Skol Vikings!